The Vizsla (pronounced "vee-shla") is also known as the Hungarian Pointer. 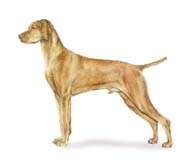 As that name suggests, the Vizsla is a pointing dog, and is primarily used in upland hunting. Nearly extinct 50 years ago, the breed has enjoyed a hearty return to the field, and now has a devoted following here in the states. Vizslas are small enough to be good dogs for a city apartment, but remember like other sporting dogs they require daily exercise. Vizsla's are sensitive dogs, devoted to those who treat them kindly and give them attention. The Vizsla is not very discriminating about to whom he shows his affection - he loves everyone. The ideal male is 22 to 24 inches at the highest point over the shoulder blades. The ideal female is 21 to 23 inches. Because the Vizsla is meant to be a medium-sized hunter, any dog measuring more than 1Â½ inches over or under these limits must be disqualified. Completely black nose. Solid white extending above the toes or white anywhere else on the dog except the forechest. White extending on the shoulders or neck. A distinctly long coat. Any male over 25-1/2 inches, or under 20-1/2 inches and any female over 24-1/2 inches or under 19-1/2 inches at the highest point over the shoulder blades. This standard was approved December 11, 1995, effective January 31, 1996. For more info, you may want to visit the Vizsla Club of America's web site.